Easter is coming! 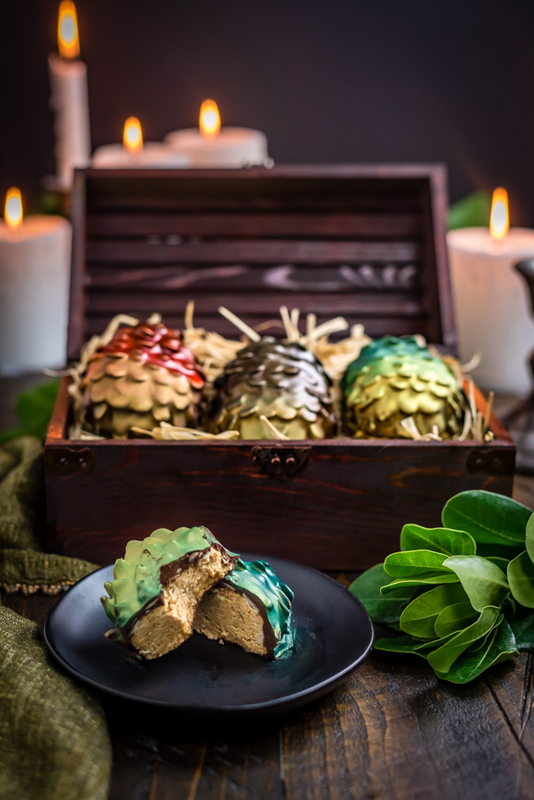 There’s no better way to celebrate the holiday and the return of Game of Thrones than by making your own Chocolate Peanut Butter Dragon Eggs at home. 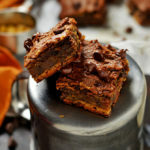 This recipe includes a Reese’s-style peanut butter filling, crunchy sliced almond “scales”, and a smooth chocolate coating. If you’re planning to throw a Game of Thrones Watch Party this Sunday, you might– like me– be jotting down ideas of how to feed your friends Winterfell feast style. 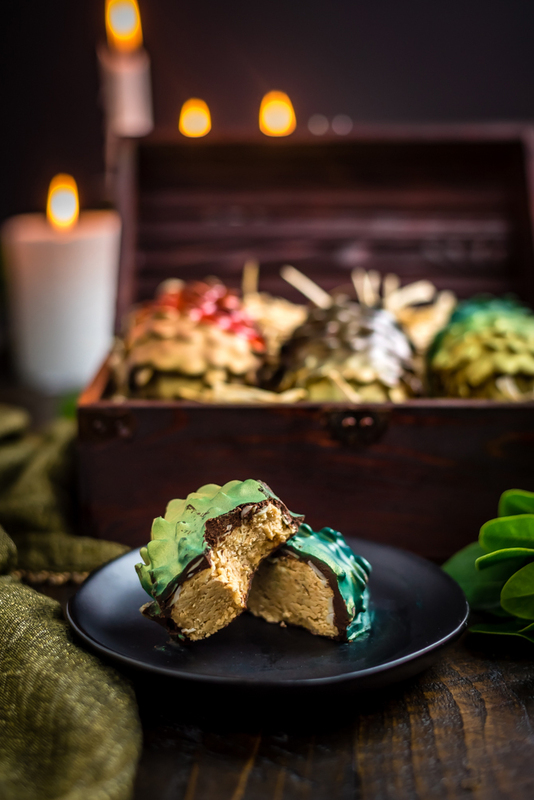 And while Medieval dishes would definitely fit the bill, I think that the real must-have recipe your watch party (or simply, “For the Watch!”) is a batch of these Chocolate Peanut Butter Dragon Eggs. 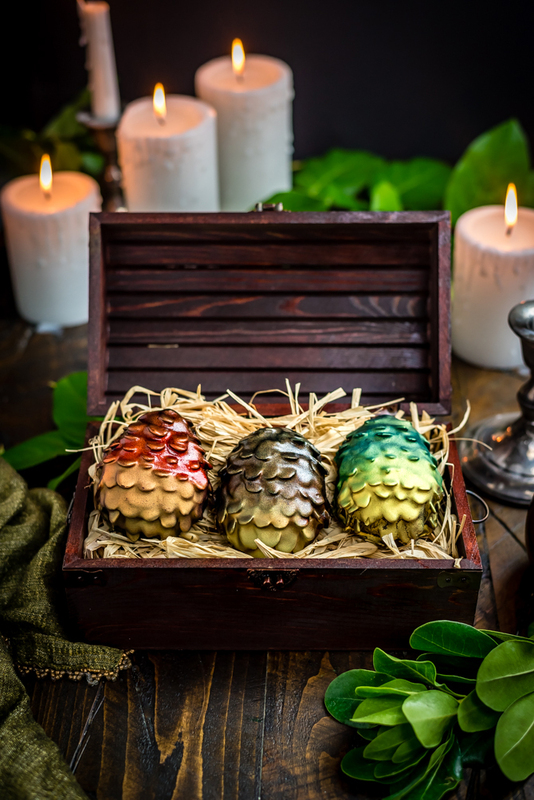 Not only are they incredibly delicious– like larger versions of the signature Reese’s Eggs– but they also look just like Danaerys’ dragon eggs. 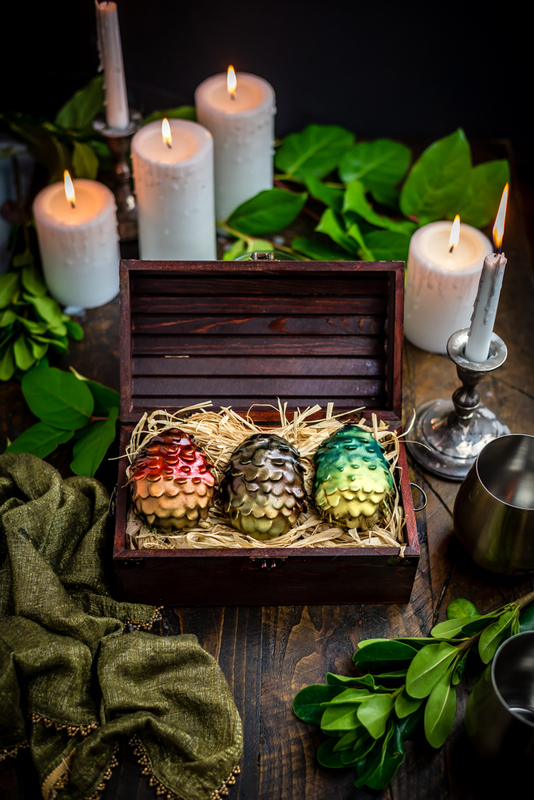 And trust me, these Dragon Eggs are worth the wait. 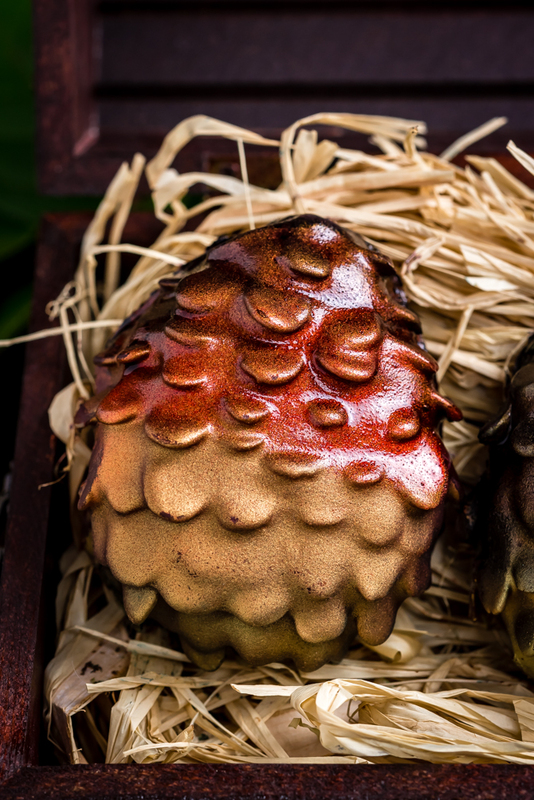 The coolest thing about these Chocolate Peanut Butter Dragon Eggs is, of course, the fact that they look like dragon eggs. 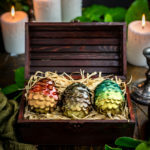 The combination of a scaly appearance and ombre-effect coloring makes them resemble the eggs from Game of Thrones, but they’re entirely edible. I’ve seen similar things done before with fondant and fancy tools (which, quite frankly, is above my level of dessert-decorating expertise), but I wanted to do something a little more approachable that also added to the flavor rather than just being there for show. The tear-drop shape of sliced almonds is the perfect solution for edible scales while also adding a slight layer of crunch to the top of your peanut butter eggs. In order to make the scale pattern, I simply start from the bottom and layer slightly-overlapping rows of almond slices all the way up to the tops of the eggs, making sure to also get some over the sides. To get the most scale-like appearance, it’s important not to use broken or slivered slices, and to not push them in so that they’re poking up too high– just a slight upward angle will give the best final look. Now, I’m not going to lie to you. This recipe is super easy to make, except for the process of layering the scales. You can do it, absolutely, but you have to be gentle when pushing the almonds in so that they don’t break. And the whole sorting through the almonds and meticulously pressing them in thing? Yeah, it takes time. Do yourself a favor and put on a podcast before you get started. Once the almonds are all in, it’s smooth sailing. 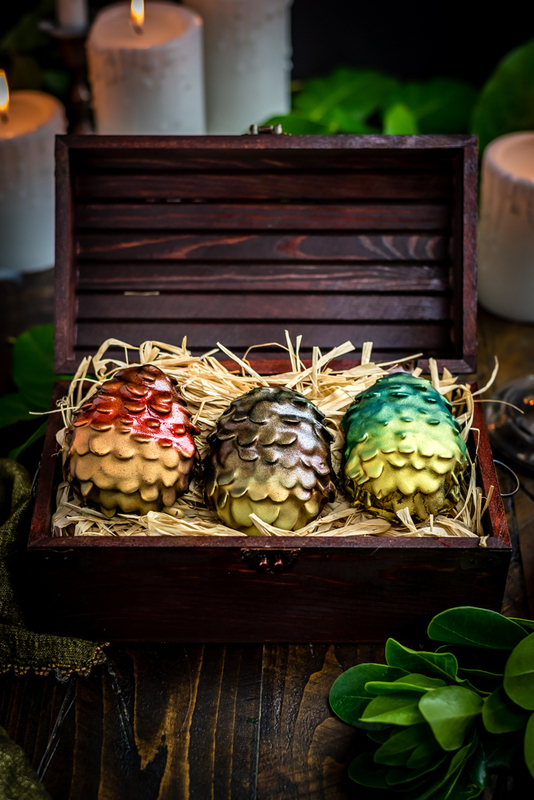 In order to finish off the dragon egg’s look, I freeze the eggs until solid and then coat them in a layer of chocolate, which will make them look less pinecone-like. When the chocolate sets, I add color using food coloring sprays. I used Wilton brand from my local craft store, but you also can paint on extract-diluted food coloring with a brush if you prefer. When coloring my eggs, I started with a base of gold, and then sprayed the tops with red, blue, and / or more gold to get the look I wanted. My favorite eggs were the ones that I kept gold at the bottom, sprayed blue 2/3 of the way down the egg from the top, and then sprayed a little extra gold in the middle to blend. It gave a great blue-to-green-to-gold ombre effect! While the look of the eggs is important, it’s all for nothing if there’s not something delicious inside. Ah, I’m sure there’s some applicable Game of Thrones metaphor quote that I should be inserting here… if you think of one, be sure to let me know. I didn’t want these eggs to just look good, they had to taste perfect as well. 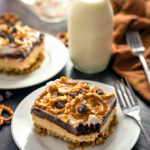 So, of course, I scoured the internet for dupes of Reese’s eggs and while most copycat recipes were good– very good– none of them seemed quite right. After a ton of experimentation and combining different ratios from different sources, I learned that the key was to add graham cracker crumbs to the peanut butter mixture. 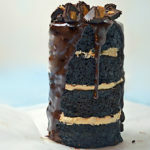 The crumbs add a grittier texture like authentic peanut butter eggs have, and they also prevent the dough from being cloyingly sweet, as it tends to be when it owes all of its structure to powdered sugar. It’s just important not to add too much, or the texture becomes overwhelming and the dough becomes too hard to shape into the signature egg shape. By the way, I didn’t have any issues shaping my dough that was made out of just peanut butter, melted butter, powdered sugar, and graham cracker crumbs, but if you are having a hard time, simply add a tablespoon or so of milk and re-mix. That will soften it up a bit! If you’re bummed out because you’re not a fan of almonds, don’t worry. While I got the best (and tastiest) results from sliced almonds, I’ve also tried making these with pepitas (AKA raw, hulled pumpkin seeds) and corn flakes, and both versions turned out fine. Any thin, oval or tear-drop shaped edible ingredient that pairs well with chocolate should be fine to substitute here. Allergic to peanut butter? No worries. You can make this recipe with peanut butter substitutes, such as almond butter or sunflower seed butter. Just be aware that you might have to tweak the proportions of your dough a bit for texture and flavor. The upside to that is that you have a great excuse to keep eating– er, I mean taste-testing— the dough. 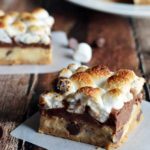 In order to get the chocolate to melt smoothly, this recipe calls for vegetable shortening such as Crisco. However, if you don’t have it on hand or prefer not to use it, you can easy swap it out for coconut oil instead for the same results. In a large bowl, combine the powdered sugar, graham cracker crumbs, peanut butter, and melted butter. Use a hand mixer to mix until well-combined. 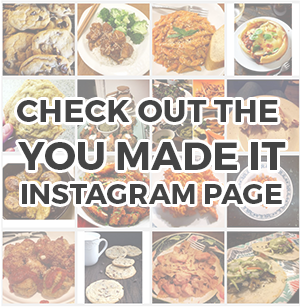 Use your hands to smush the dough together and roll into 2″ balls. If the dough is too crumbly, mix in a tablespoon of milk at a time to soften it. Place the peanut butter dough balls onto a wax paper lined baking sheet and gently press into egg shapes. Starting from the bottom, very gently push in the sliced almonds, overlapping each layer slightly, to give a scaly look. Be careful not to push hard because the almonds can easily break. This step requires some patience! Transfer the baking sheet to the freezer and allow to chill until solid. In a medium-sized, microwave safe bowl, combine the chocolate chips and shortening. Microwave in 30 second intervals, stirring in between, until smooth and entirely melted. One at a time, set a peanut butter egg on top of a fork or spoon and dip into the melted chocolate. Spoon over the chocolate and flip to coat. Using the fork, lift the egg from the chocolate. Shake and tap the handle of the fork against the bowl to encourage any excess chocolate to drip off and better reveal the scales. Set back onto the wax paper and repeat for remaining eggs. Let the chocolate dry and set. To speed up this step, you can set the baking sheet of eggs in the refrigerator. Spray the eggs all over with gold food coloring and then use gold, blue, and red to create an ombre effect. The best results occur when keeping gold at the bottom and layering the other colors from the top down. Allow the spray coloring to dry, and then serve. Measuring the amount of almonds is tough to do, as the amount of intact sliced almonds will vary depending on the bag. Look for bags of sliced almonds that aren’t broken up, because you can’t use the broken ones! I bought a 16 ounce bag for this recipe, and while I didn’t use even half of the almonds slices, I was glad that I could easily and quickly pick through for pieces that weren’t broken. These are great and just in time for the show this weekend! I will absolutely be making these! I am most definitely counting the minutes til GoT. What a clever recipe!!! OH MY GOODNESS!! THESE ARE AMAZING! I love how great they look. I’m sure those scales take time and patience, but SO, SO worth it!! Oh my, these are so pretty. I am not sure if I would eat them, great for Easter!